A comprehensive overview of this rapidly expanding interdisciplinary field of research. After a short introduction to the basics of magnetism and molecular magnetism, the text goes on to cover specific properties of molecular magnetic materials as well as their current and future applications. 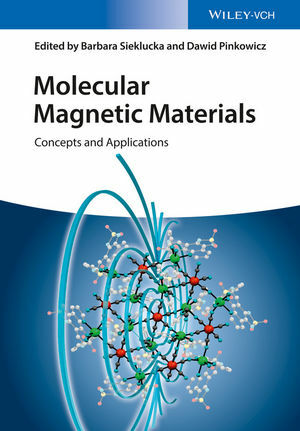 Design strategies for acquiring molecular magnetic materials with desired physical properties are discussed, as are such multifunctional materials as high Tc magnets, chiral and luminescent magnets, magnetic sponges as well as photo- and piezo-switching magnets. The result is an excellent resource for materials scientists, chemists, physicists and crystal engineers either entering or already working in the field. Barbara Sieklucka is currently Full Professor for Inorganic Chemistry at the Jagiellonian University in Krakow, Poland and Head of Inorganic Molecular Materials Group as well as co-founder of the European Institute of Molecular Magnetism. She carries out pioneering research on multifunctional molecular magnets in Poland. Her research activities are focused on the crystal engineering of highly-structured functional molecular materials on the basis of polynuclear cyanido-bridged coordination compounds, which will allow to impose specific functionalities such as dynamics, sorption, magnetism, photomagnetism, porosity, luminescence, chirality, and non-linear optics on the target material, with the ultimate goal of achieving multifunctionality and efficient engineering of the nanospace within the crystal network. This fundamental research has the clear application perspective: it may generate new advanced materials for the construction of nanoscale molecular devices with potential applications in nanotechnology or spintronics such as molecular sensors and switches, magnetic coolers, spin valves and spin logic gates. Dawid Pinkowicz is currently Associate Professor at the Jagiellonian University in Krakow, Poland. He has received his Ph.D. from Jagiellonian University with Prof. Barbara Sieklucka and then moved to Prof. Masahiro Yamashita for the research project "Photo-Switchable Single-Molecule Quantum Magnets" within the Matsumae International Fellowship Program. Afterwards he has joined Prof. Kim Dunbar´s Group for the research project "Multifunctional Molecular Materials through Cyanide Chemistry" within the Marie Curie International Outgoing Fellowship funded by the European Commission within the 7th Framework Programme. His research interests cover the design of tailor-made functional ligands and complexes for the construction of multifunctional molecular compounds and the electronic and magnetic properties of soft matter under extreme conditions: high pressure and low temperatures.